BAYFEST 2007 » Country singers Gretchen Wilson and Alan Jackson rule at this year’s BayFest. Plus, Canadian rockers Three Days Grace will also take the stage. The annual event benefits Marines, sailors and their families stationed in Kaneohe. A test ferry from Honolulu to Waianae and points between begins Sept. 4. Hawaii ranked among states with the least cost-effective highway systems in a study released yesterday. Maui girded for a third day of smoke, flames and traffic headaches. Maui Pineapple Co.'s closure of its plant leaves lives in limbo. Thrash-metal band Three Days Grace looks forward to its first concert in Hawaii. 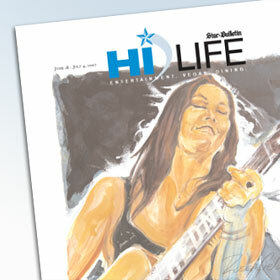 Tia Carrere returns to promote the new CD, "Hawaiiana," she made with Daniel Ho. KUMU-1500 will add a 2-hour p.m. show next month that will be half devoted to sports. A triple-digit increase in cruise ship arrivals to Hawaii helped boost overall visitor spending in May. Officials expect to be profitable within their first year of operation despite the interisland airfare war. A state program has helped to shield 168 acres of agriculture land on Molokai. Diabetes is being diagnosed in children by increasing numbers.